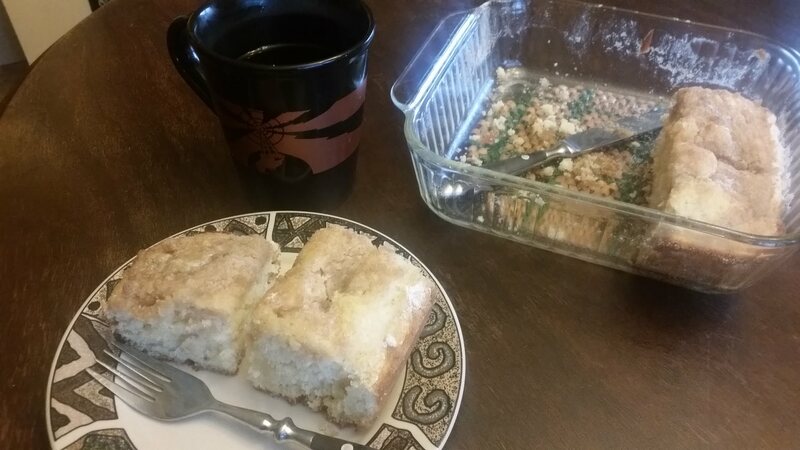 This is a moist coffee cake with ribbons of buttery goodness throughout. It is easy enough to whip together before guests come over or as a warm delicious breakfast bread. Either way, this is a great recipe to have in your wheelhouse. Mix together all the dry ingredients in a bowl. Add the shortening, milk, and eggs then mix thoroughly. There will still be lumps of shortening and that is OK.
Pour the batter into a greased 9×13 cake pan. For the topping mix together the brown sugar, flour, and cinnamon using a fork to break apart the larger clumps. Evenly pour the topping over the cake batter in the pan. Cut the butter into small pieces and place evenly over the top of the topping. Bake at 375° for 30-35 minutes or until an inserted toothpick comes out clean. I love barbecue sauce. Some may suggest I love it too much. There are so many varieties you can sample and they can really compliment a meaty burger or brat. 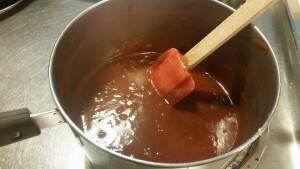 Being a lover of whiskeys and bourbons as well, here is my take on a bourbon barbecue sauce. Add the bourbon and simmer for 10 minutes, stirring occasionally until the onions are translucent. Add all the remaining ingredients except the water and the corn starch. Bring your sauce to a boil and then reduce heat to simmer for 15 minutes, stirring occasionally. Mix the water and corn starch together and stir vigorously until it is absorbed by the water into a milky concoction. Pour the water into your sauce and continue to simmer for 5 minutes. Stir constantly for 1 minutes and then continue to simmer and stir 4-5 minutes until the sauce thickens. Let cool and store in the refrigerator until you need it or follow regular canning guidelines if you wish to keep it without refrigerating. There’s a lot of opportunity to change up this recipe. Try adding a few Tbsp of liquid smoke are add hot peppers with your onions in the beginning. The only person that knows what you like is yourself, so feel free to put your soul into what you make by doctoring the recipe to your tastes. Whether it’s for a holiday meal opener or just a hearty winter warm-up, butternut squash soup is a smooth and thick that comes together rather easily in about an hour. Start by prepping the vegetables. Chop the onion, carrot, and celery. Set aside. Peel and cube the potatoes and squash. Heat a large pot on the stove top to medium and then melt the butter. Place all the cut vegetables into the pot and cook for 5-8 minutes to get a nice light browning. Pour as much broth as is necessary to cover the veggies. Bring to a boil and then reduce heat to low. Cover and simmer for 40-45 minutes until the veggies are tender. Ladle or scoop the softened veggies into a blender and blend until smooth. Return to pot and add broth until desired consistency. Some people just choose to salt and pepper the soup and serve it. Consider adding a finish that is to your own tastes, such as adding a cinnamon and sugar blend or bringing the heat with a smoky chipotle pepper seasoning. Butter squash soup is a neutral flavor base that can easily be modified.